Outspoken Israeli playwright Joshua Sobol isn’t a big fan of theater whose only purpose is to entertain. Indeed, he’s always made it his mission to confront some of the most radioactive social and political questions of our time in his work — even if it’s often landed him in hot water. His controversial 1987 drama “The Jerusalem Syndrome,” which drew parallels between Roman persecution of Jews in ancient times and Israel’s occupation of the Palestinian territories, led to a huge national uproar and his ouster as artistic director of the Haifa Municipal Theatre. Sobol’s Israeli Stage residency will strive to provide exactly that kind of public forum. It will feature lectures and dialogue at three Massachusetts universities (Holy Cross, Emerson College, Boston University) and at Boston’s Temple Israel on the topic of “theatre as a form of resistance to oppression.” Conversations with Sobol will also take place on March 23 at Brandeis University and March 26 at New Repertory Theatre in Watertown. And Israeli Stage will sponsor a staged reading of Sobol’s new play “David, King” at Wellesley College on April 5. 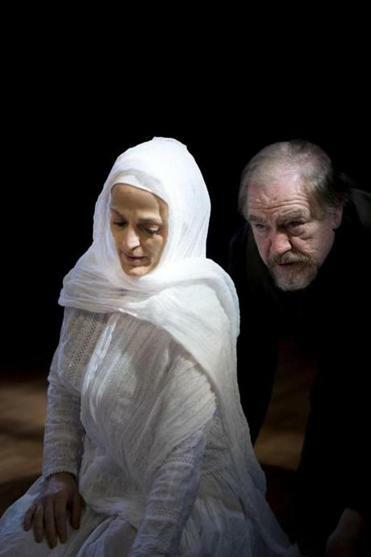 The play offers a modern twist that speculates on David’s reluctance to hold the throne. Theatergoers will also be able to catch a full production of Sobol’s play “Sinners,” directed by Emmy and Olivier award-winning actor Brian Cox and starring his wife, Nicole Ansari, from March 23 to April 2 at Boston University’s TheatreLab@855. In the searing drama, Ansari plays Layla, a married Muslim woman and university professor who has an affair with one of her students and faces the prospect of being stoned to death in an unnamed country. This production of “Sinners” from Vermont’s Greensboro Arts Alliance and Residency/Mirror Theater will be presented by New Repertory Theatre and the Boston Center for American Performance. In “Sinners,” a shrouded figure is buried up to her chest in front of a blood-stained brick wall. The woman, Layla, confronts her lover, Nur, who’s been forced to gather and pile up the stones that will be used to kill her. The action centers on their conversation, as Layla professes her love for Nur, wonders if he was the one who confessed their affair to the authorities, confronts him with questions about his own cowardice, and rages against the ways that societies fear the feminine. Sobol says he was inspired to write the play after reading about the sanctioned stoning of women in some Middle Eastern countries. Ansari says that Sobol is the kind of writer who pushes back against the lies, deceptions, and brutality of those who hold power. “I think good theater should always be some kind of resistance,” she says.